We are often asked the advantage of staying at a Disney Resort over hotels and motels situated nearby. Aside from the fact that every resort is uniquely themed and has its own set of amenities, and that Disney runs some of the best maintained hotels on the Planet, they are also well maintained and provide a immersion in the magic of Walt Disney World. Each day, one of the four parks will open early or close late on a rotating basis providing an "Extra Magic Hour" for guests. Complimentary Transportation: Monorail, Motor Coach (Bus), Ferryboat and Water Taxi transportation is provided to all points of interest on the Disney Property. Midday Breaks: Because you are so close by, it's easy to make a short trip back to your hotel when you feel tired or want to take a break from the crowds. As a Disney guest you have the option of adding charging privileges to your magic band or room key. You can leave a cash payment or a credit card. You never have to leave the "magic". Resort delivery for packages and purchases. 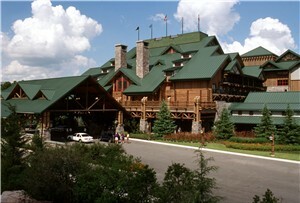 Disney Resorts also have special services for children, including unique child activity centers, in-room babysitting, learning programs and dinner clubs. Guests of Disney hotels can use the complimentary Magical Express service which allows those arriving at Orlando airport to check their bags at their hometown airport, bypass baggage claim at Orlando International Airport and board state-of-the-art motor coaches to the Walt Disney World Resort. (Please note, the luggage delivery service is available for flights arriving between 5:00 a.m. and 10:00 p.m. If you flight will arrive earlier, or later, you will need to collect your luggage at the airport and bring it with you on the Magical Express bus). On the return home, vacationers flying on participating airlines can use the Resort Airline Check-In Service which allows you to bring your checked bags to a location at your Walt Disney Resort. You won’t have to cart them to the airport. You will pick up your bags when you arrive at your destination airport. Book dining 180 days in advance of your arrival at Disney World for your entire vacation (Up to 10 days or less - known as 180 + 10). Book Fastpass+ reservations for your favorite rides and attraction 60 days prior to your arrival at Disney World (Requires you have valid park tickets linked to you’re my Disney Experience account). On-line check-in prior to your arrival at Disney World.